Significant archaeological remains, including Neolithic pits, a prehistoric enclosure and an Anglo-Saxon cemetery, have been found on a site at Tidworth, Wiltshire. The excavation, by Wessex Archaeology, was undertaken ahead of building works associated with a £70 million housing development, providing 322 new homes for Army families, by the Defence Infrastructure Organisation (DIO) in partnership with Hill, an award-winning housebuilder. The pits contained Late Neolithic Grooved Ware pottery of the Woodlands style, and flint tools, antler and burnt flint. The Anglo-Saxon cemetery consisted of around 55 burials, with men, women, juveniles and infants all present. The grave goods, which are consistent with a late 7th- to 8th-century date, included spears, knives, a shield boss, bone combs and pins, buckles, jewellery and a finely decorated bronze workbox. The finds are currently being studied by specialists at Wessex Archaeology in Salisbury. The Anglo-Saxon cemetery at Tidworth contained around 55 burials and appears to represent a cross-section of a local community, with men, women and children all present. The siting of the cemetery just west of a prehistoric enclosure, possibly ritual in nature, is consistent with a pattern seen widely across the region. The cemetery, which included graves aligned both north–south and east–west, may have been focussed on a prominent east–west grave at the centre of a small circular ditched enclosure. The cemetery appears to have been bounded to the west by a shallow ditch broken by a 4 metre wide entrance way. 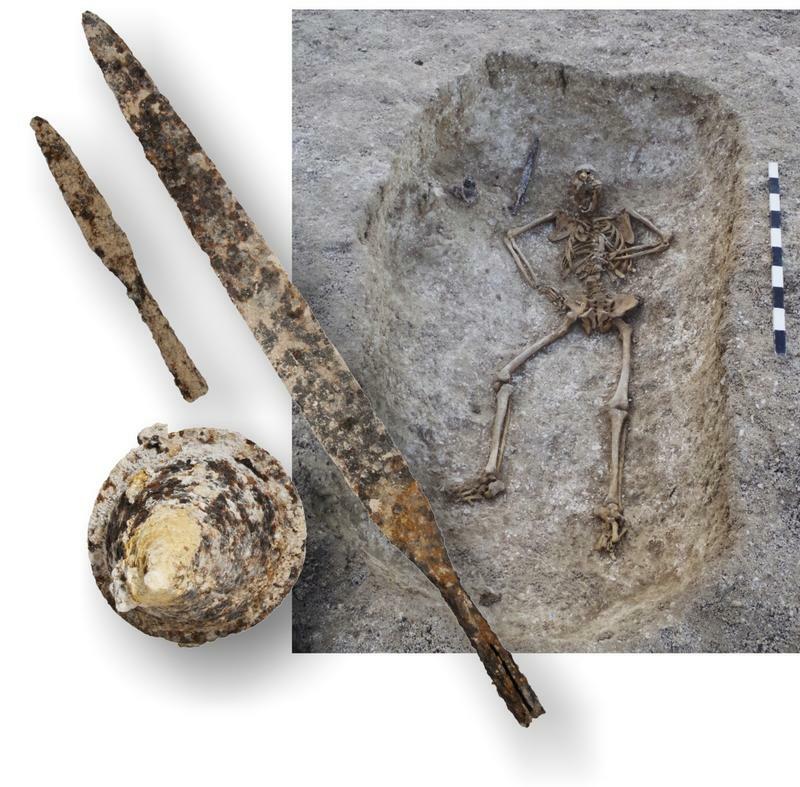 The majority of the burials were accompanied by grave goods, the most common of which were iron knives, recovered from both male and female graves. 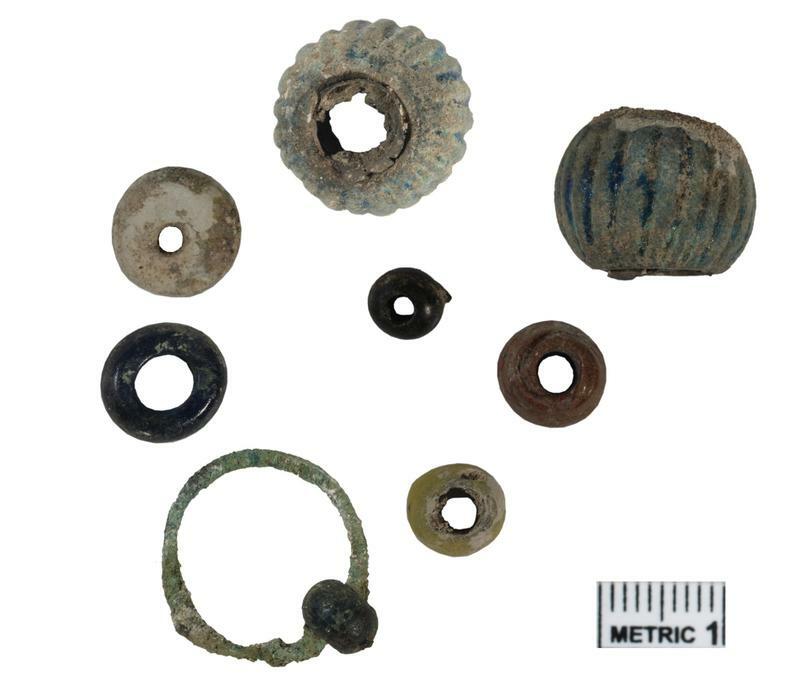 Several spearheads and a conical shield boss were also recovered from male graves, while items of jewellery from female graves included beads and wire rings which appear to have been strung on necklaces. Several bone combs and a bone pin were also recovered. One female burial also contained a chatelaine and a finely decorated workbox. The grave goods are consistent with a late 7th- to 8th-century date, which suggests the Tidworth Anglo-Saxon cemetery is contemporary with another around 8 kilometres to the south-west at Bulford – also recently excavated by Wessex Archaeology. Not only is each site significant in its own right, but the opportunity to compare and contrast the contemporary cemeteries of two neighbouring communities has important research potential. A recent excavation in Tidworth, of a 1300-year-old Anglo-Saxon cemetery, was visited by wounded, injured and sick service personnel and veterans from the Help for Heroes Recovery Centre, Tedworth House. Archaeologists from Wessex Archaeology showed them the work in progress and some of the finds from the site, as well as discussing their significance. Builders working on the new Tank Regiment base at Tidworth have discovered Bronze Age burials. Dating back to the time of Stonehenge, the four graves are 3,500 years old making them the oldest finds from Tidworth.